The "Bill of Rights Day 2019 - Birthday Cake Celebration" on Friday, December 13, 2019, is in keeping with the National Education Project's ongoing effort to restore the Bill of Rights to America by providing a free printed copy of the Bill of Rights to every child in the Nation. It is simply not possible to know your rights as an American if you do not have a printed copy of the Bill of Rights actually in your hands. Which is why the Founding Fathers wrote it down in the first place 228 years ago. 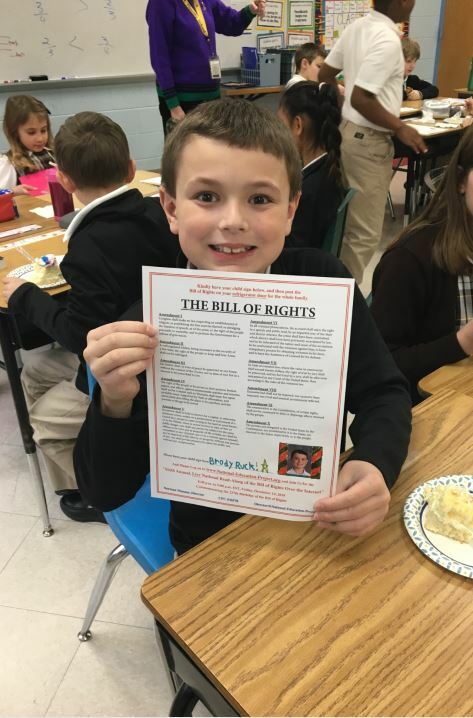 Last year, on Bill of Rights Day, December 14, 2018, the National Education Project provided free birthday cakes and free copies of the Bill of Rights to children in 56 classrooms in 24 public, charter, and parochial elementary schools in Washington, D.C., as well as to elementary school children in seven states across the country, including Texas, Florida, Ohio, Virginia, New York, Wisconsin, and Oklahoma. The results around the country were remarkable. Through the support of the New York City Police Department and the good offices of Chief of Patrol Rodney Harrison, police officers picked up the birthday cakes from Costco and delivered them to 15 elementary schools in Manhattan, including three schools in Chinatown. So there it is: kids, cops, a birthday cake, singing, and the Bill of Rights. If that's not America, I don't know what is. We hope to have the continued support of the New York City Police Department and to extend this wonderful old-fashioned, patriotic event to all five boroughs in New York City (Manhattan, Queens, The Bronx, Brooklyn, and Staten Island) on Bill of Rights Day, Friday, December 13, 2019. Here are additional results from around the country. For the second year in a row, the South Florida Chapter of the Federal Bar Association in conjunction with the National Education Project commemorated the birthday of the Bill of Rights with a birthday party at North Beach Elementary School. 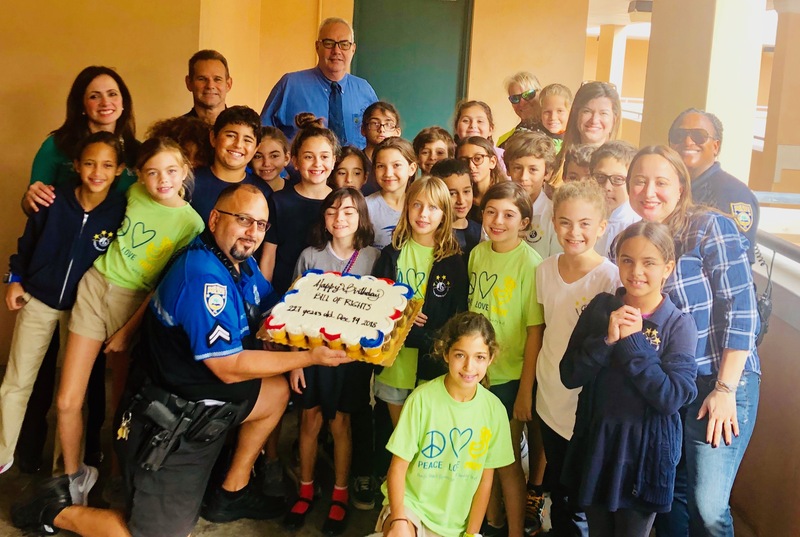 Police officers of the Miami Beach Police Department graciously delivered the cakes to eight 4th grade classes, and helped the children sign their copies of the Bill of Rights. As was said at the end of the celebration: "Another successful year. Kids had a blast." 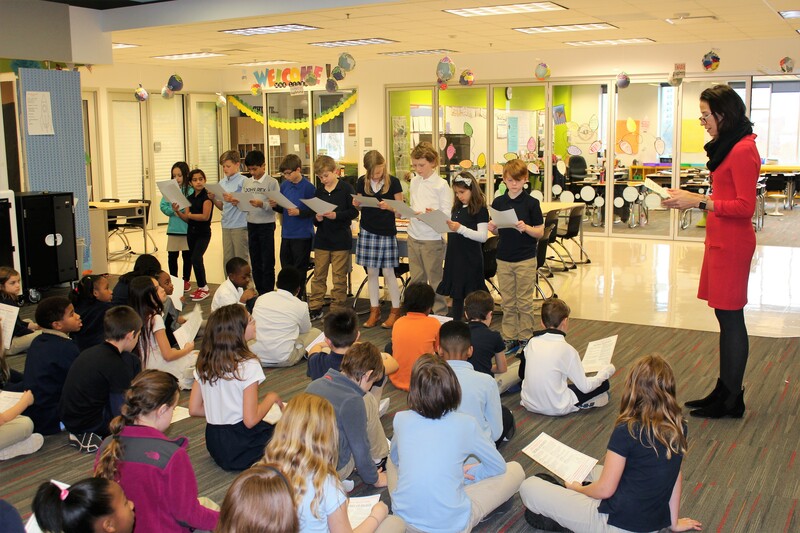 The Northern District of Ohio Chapter of the Federal Bar Association hosted the Bill of Rights Day birthday cake celebration at the Campus International Elementary School in Cleveland, Ohio. The event went very well, with approximately 80 fourth grade students participating. 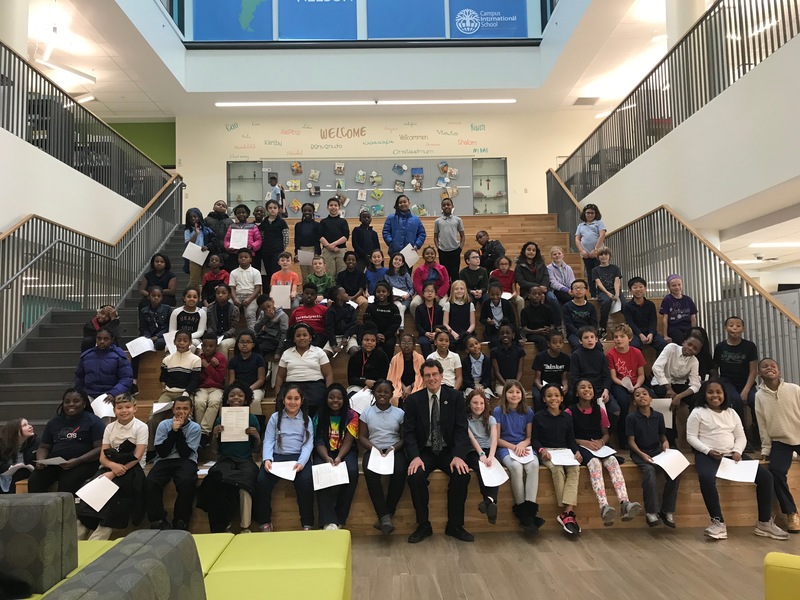 We were greatly honored that Judge Dan Aaron Polster of the United States District Court for the Northern District of Ohio and Ms. Sarah Cleves of the FBA gave to each student a copy of the Bill of Rights. Then Judge Polster spoke to the students about the Bill of Rights, what it means, and its importance. The students loved asking the Judge questions, both about the Bill of Rights and about his job. And, of course, they loved the cake! 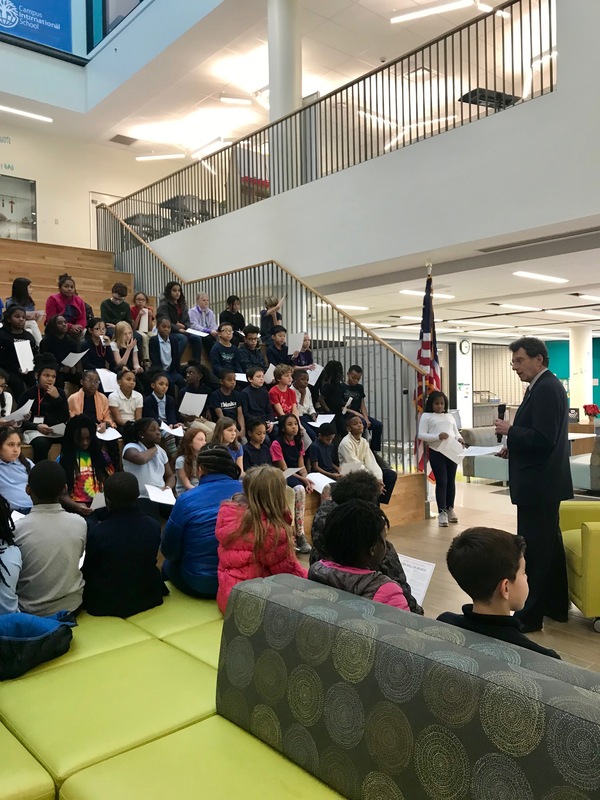 On December 14, 2018, Magistrate Judge T. Shon Erwin of the U.S. District Court for the Western District of Oklahoma and Ms. Jodi Dishman, President of the Oklahoma City Chapter of the Federal Bar Association, visited with approximately 40 4th and 5th grade students at Gatewood Elementary School in Oklahoma City to celebrate the 227th birthday of the Bill of Rights. 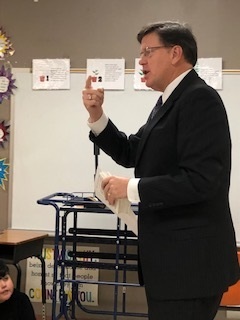 Judge Erwin talked about the importance of the Bill of Rights and engaged with the students in answering their questions about the Bill of Rights. We then distributed copies of the Bill of Rights and asked the students to sign and keep their copies. Next, Judge Erwin had volunteer students read each amendment (we had more students volunteer than amendments to read!). We then sang Happy Birthday to the Bill of Rights, and enjoyed delicious cake. The students were incredibly energetic, engaged, and grateful for our birthday celebration. We cannot wait to return to Gatewood Elementary next year for the Bill of Rights Annual Birthday Celebration. 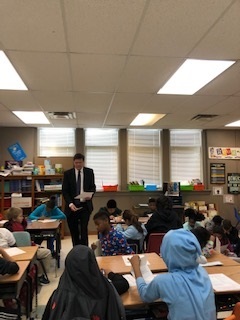 U.S. Magistrate Judge Suzanne Mitchell of the U.S. District Court for the Western District of Oklahoma and Mr. Jake Krattiger of the Oklahoma City Chapter of the Federal Bar Association visited the John Rex Charter Elementary school's 4th grade class for the 227th birthday celebration of the Bill of Rights. After talking about the United States Constitution a bit, and quizzing the students about the three branches of government, the classroom teacher selected 10 students to read one amendment each. The students did a tremendous job, and the other students eagerly followed along with their own copies of the Bill of Rights. We sang Happy Birthday and reminded the students of their ownership -- individually -- of the Bill of Rights. After devouring the cake, the students thanked us for coming. It was an inspirational way to start the day! Over 1,100 children in 48 5th Grade classes in six public elementary schools in Homestead, Florida participated in the Bill of Rights Day birthday cake celebration. 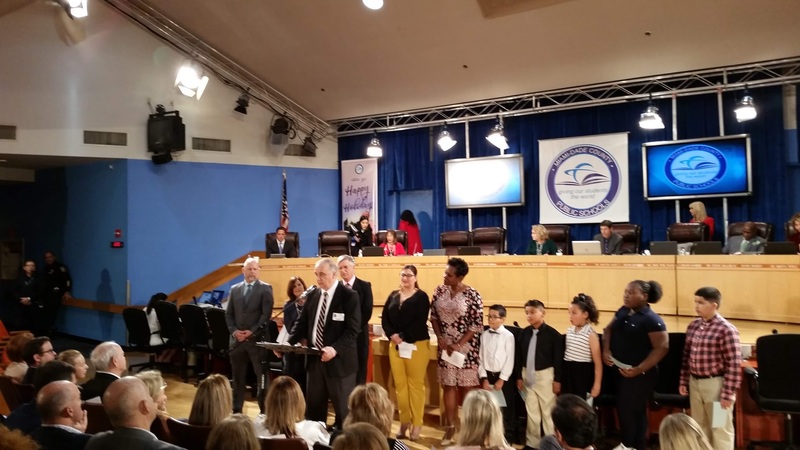 The National Education Project, Inc. was also presented with a Proclamation at a meeting of the Miami-Dade County School Board on December 19, 2018, that graciously acknowledged the Project's commitment "to creating a renewed and vibrant awareness of the Bill of Rights" in the lives of Americans across the country. 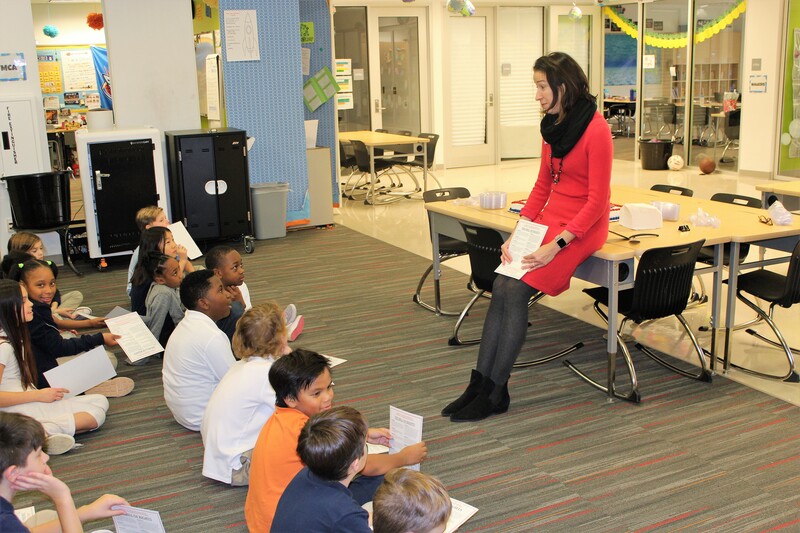 The National Education Project, Inc. will commemorate Bill of Rights Day this year on Friday, December 13, 2019, by providing free birthday cakes to 4th Grade classes in the District of Columbia that are studying the Bill of Rights. Last year 24 schools throughout Washington, D.C. participated in this wonderful program. The Project will also be providing free birthday cakes and free copies of the Bill of Rights to elementary schools across the country, including schools in Florida, New York, Ohio, Oklahoma, Texas, Virginia, Wisconsin, and other states. Note that "Bill of Rights Day" this year officially falls on December 15, 2019. Because this date is a Sunday, however, the Project will celebrate Bill of Rights Day on the previous school day, Friday, December 13, 2019. 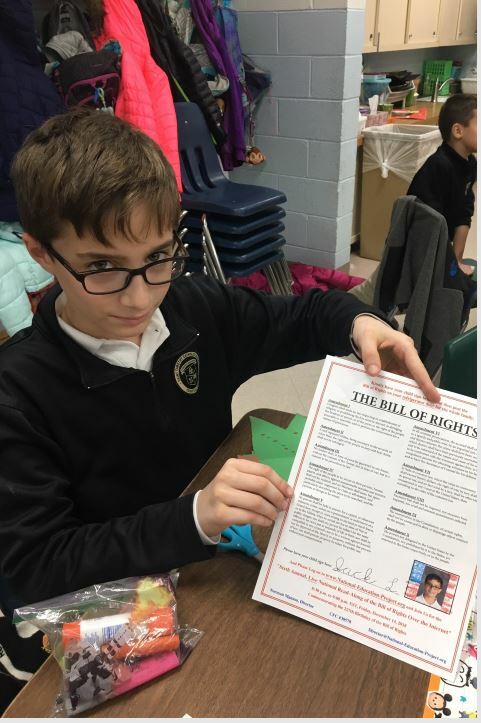 In addition to free birthday cakes, free copies of the Bill of Rights will be distributed in all participating elementary schools, which the children can then sign and take home to post on the family's refrigerator door, where, for the next 20 years, it will remind everyone in the home of their rights and liberties as Americans. The cakes will be for elementary school classes studying the Bill of Rights. This is usually 4th, 5th, or 6th grade, as determined by each state. The cake will be a sheet cake of sufficient size to provide a piece of cake to every child in the classroom, as well as the teacher, principal, and classroom aides. All the cakes will be produced by a commercial bakery (e.g., Costco, Safeway, Whole Foods, Giant, etc.). Each cake will be decorated with the phrase: "Happy Birthday, Bill of Rights, 228 Years Old, December 15, 2019." This event is purely voluntary on the part of the schools, principals, and classroom teachers. The school may be public, magnet, charter, or parochial. A school that has more than one class studying the Bill of Rights will receive one sheet cake for each class. There is no cost whatsoever to the schools, the children or their families. The National Education Project will pay all costs of the cakes, as well as forks, plates, and napkins. All parties must keep in mind that the "Bill of Rights Day 2019 - Birthday Cake Celebration" is strictly non-partisan and non-political. The schools are encouraged to ask the local police department to deliver the cakes on Friday, December 13, 2019, something that would certainly get the attention of the children. Participation by the police department may engage the local press, providing a fine visual story, as well as a powerful symbolic moment, for the newspapers and the evening television news. 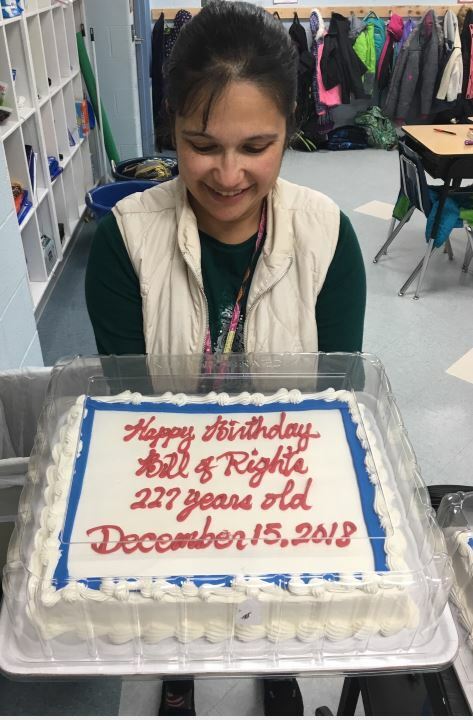 It is our hope that the classroom teachers will incorporate lessons about the Bill of Rights into classroom activities during the week beginning Monday, December 9, 2019, culminating with the Bill of Rights birthday cake on Friday, December 13. We also hope that the teachers will encourage their students to read the Bill of Rights with their families that same evening, December 13, during the Project's "Seventh Annual, Live National Read-Along of the Bill of Rights over the Internet" at 8:30p.m. EST. Just logon to: www.National-Education-Project.org and read the Bill of Rights along with your fellow Americans all across the country. Please note that the National Education Project, Inc. is a non-partisan, non-political 501(c)(3) tax-exempt, non-profit corporation, and the Project does not recommend or encourage any particular interpretation of The Constitution of the United States or the Bill of Rights. We simply give you a free copy of the Bill of Rights and you figure it out, which is your obligation as an American, especially if you have children. 3. Then, together with our schoolchildren here in Washington, D.C., read the Bill of Rights over the Internet to the entire Nation. To see the wonderful video of the children reading the Bill of Rights in 2018, just click on the arrow in the middle of the picture below. So please download your free copy of the Bill of Rights (CLICK HERE) and plan to join us for the National Education Project's "Seventh Annual, Live National Read-along of the Bill of Rights over the Internet" at 8:30p.m. EST, on Friday, December 13, 2019. Just logon to www.National-Education-Project.org and read this great document of freedom along with our schoolchildren here in Washington, D.C.
You and your family would be most welcome!